There have been several comparisons between Bitcoin (BTC) and Gold. In fact, some experts have called Bitcoin ‘digital’ or ‘new’ gold. Here’s an interesting fact about these assets: they have had an almost identical price performance. Bitcoin has less than ten years in the market, but it already has some incredible similarities with gold in terms of performance. 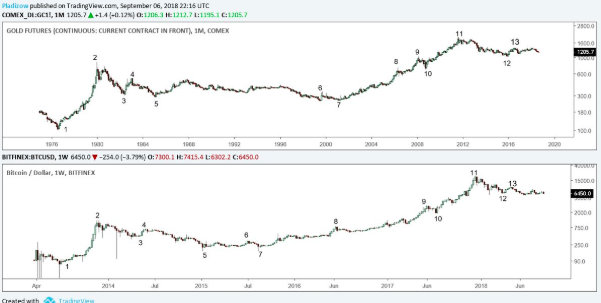 The Twitter user Nunya Bizniz published an image in which it is possible to see Bitcoin’s price between 2013 and 2018 and Gold’s price from 1976 until today. The similarities are completely shocking. The twitter user said that both charts had an ‘uncanny’ resemblance using a log scale. Clearly, the gold chart has a longer time frame, but the results are surprisingly similar. Some time ago, the famous US economist Paul Krugman, said that Bitcoin has more utility than gold. Indeed, he explained that gold is dead and that Bitcoin has more utility than gold. ‘There is some chance for Bitcoin to be valuable in the future,” he stated. At the same time, the entrepreneur and investor, John Pfeffer, explained that Bitcoin is the first viable replacement for gold. This is similar to what the famous Winklevoss twins said in the past. There are several benefits related to Bitcoin that gold cannot offer. For example, Bitcoin is portable, but gold cannot be transported in such an easy way. At the beginning of the last year, Bitcoin surpassed gold’s price for the first time. Back in March 2017, the price of the famous virtual currency was $1,268 and a troy ounce of gold was worth $1,233 dollars.